'Star Wars: Last Shot: A Han and Lando Novel' review: A return to classic Han and Lando, timeline issues be damned – AiPT! 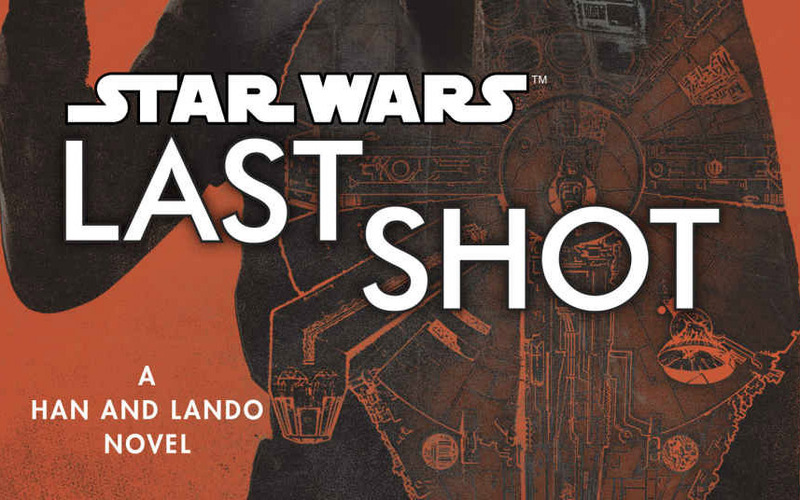 The latest adult Star Wars novel to be released is Star Wars: Last Shot by Daniel José Older. The novel is a tie in to the recently released movie: Solo: A Star Wars Story and is set as a sort of a prequel/sequel to the movie, but is more reminiscent of the old action-adventures novels with Han and Lando. Last Shot takes place mostly over three different time periods. The framing story takes place two years after the Battle of Jakku, when Ben Solo was two years old (also 7 years after the Battle of Yavin, i.e., 7 ABY). The remaining two sections take place before A New Hope; one taking place when Han and Chewie own the Falcon (i.e., after Solo) and one taking place when Lando and L3 own the falcon (i.e., before Solo). There are also a couple of minor sections that follow the villain of the book and take place before the Lando sections. The story follows a Pau’an (the people from Utapau with the striped faces from Revenge of the Sith) named Fyzen Gor as he develops, and attempts to use, a device called the Phalanx Redux Transmitter which can essentially take over any droid that he wants, causing it to kill any “organics” in the vicinity. Chronologically, the story starts as Gor is confronted with the idea that he feels droids are superior to organic creatures, and therefore deserve the same, if not better, treatment than their organic counterparts. So he figures out a way to install organic body parts on droid bodies, essentially the inverse of what was done to Darth Vader and General Grievous. Throughout the story Gor interacts with first Lando and L3, then later Han and Chewie, and eventually both of them together. The story is laid out so all of the sections are mixed up together. This is done to better preserve the “surprise” at the end of the story, which I honestly didn’t see coming. I can understand organizing the book this way, however the shuffling of the sections often left me a bit confused as to what was going on at any particular point. Frequently they would skip back to a different time period and my first thought would always be, “Now wait, what was going on here?”. Looking at the story as a whole, at times I felt it was not anywhere near the best of the new canon. A guy who threatens the whole New Republic with certain destruction by taking over all of the droids and replacing parts of them with Wookiee and other organic parts? It sounds like it could be another ‘villain of the week’ issue that the old Legends canon did time after time. But really, that’s what makes this book work. Older takes the old Legends tropes and makes them work for him. It feels like he took inspiration from Brian Daley’s Han Solo Trilogy and L. Neil Smith’s Lando Calrissian Trilogy and fit them into the new canon. Were those original trilogies perfect? Heck no, but they were fun. And that’s what it felt like Older set out to do: make a fun Han and Lando adventure story. The highlight of the novel is the characters. Han, Lando, and Chewie in particular feel genuine and their characterizations are spot on. I love the banter between them because it feels like the original trilogy characters. The villain, Gor, is fine. I don’t have any major grievances with him. He felt like a villain of the week put into the story to make Han and Lando shine, which they did. Both Han and Lando have their own personal struggles that they are working through as well. Han is struggling with being a parent. He doesn’t feel cut out to do it and just feels like he is messing everything up, a sentiment I’m sure a lot of new fathers (and even seasoned fathers) feel (this one included). And although Han’s parental struggles get overly emphasized and brought up maybe too much in the narrative, they are handled well in the book. In Han’s backstory we also get some great scenes with Sana, who was made famous for being introduced as Han’s “wife” in the Star Wars ongoing comic series. Lando, on the other hand, is having issues with commitment. We are introduced to a love interest for Lando (Kaasha) and how he feels about her possibly being the one. We don’t any endgame resolution on that one but I can see her popping up in later novels. Lando’s troubles are written perfectly and it helps Lando to become the shining star of the novel. That and his interactions with L3 are my go-to sections for the best parts of the book. There is one other character introduced in the novel that has a major part in the book and I would be remiss if I ignored their inclusion: a non-binary character named Taka. The character themselves was great — well written and the voice acting of the audiobook felt spot-on for their characterization. I guess my only issue would just be an issue with the English language. When Chuck Wendig introduced a non-binary character, Wendig used the pronouns ‘zhe, zher, etc.’, however in this book Older uses ‘they, their, etc.’, which is fine but often I am left momentarily confused on who the multiple people are. I have no gripes with the non-binary inclusion, but what I would like is a consistent English-based pronoun for them. It would make staying in the story for me, and I’m sure many readers, easier. But that’s a minor gripe, and one that I barely even noticed after a third of the way into the novel. My one major, and this is super major, problem with the story, is the timeline of the story. All of the different parts of the story can fit easily into the current canon. The problem, though, comes up when you use Older’s dates for the different parts. Some of them just can’t happen when he says they do. Han Solo’s part is listed as “About 10 Years Ago”, which would be 10 years before the present time at 7ABY. That would be 3 BBY (Before the Battle of Yavin). That one works. The Lando sections though are listed as “About 15 Years Ago”, which would place it at 8 BBY. This is where we start to run into some issues. In the book during the Lando sections, Lando is flying around in the Millennium Falcon with L3. However, the majority of the Solo movie takes place at 10 BBY, two years before this section would happen. So the Lando sections couldn’t take place in 8 BBY. You could use the “But it says ‘About 15 years ago'”, however at later parts in the story he specifically calls out that it has been 12 years for certain parts to have occurred and it just couldn’t have been. You could say I am being nit picky here, and I might be, but when my primary focus in the Star Wars canon is continuity and timeline placement of the various materials, this becomes a real sticking point for me. I even stopped the novel at one point and wrote down all of the dates because they didn’t feel right, and sure enough, nope. Can’t work as written. As with the other recent Star Wars books, I listened to this book as an audiobook and it was unique because even though it was a single story novel (unlike the anthology books), this book had multiple readers. Each time period was read by a different person so that it was very easy to keep track of which time period you were in by which voice you were listening to. To top it off, one of the sections was even read by the author, which was fun because you could tell he really got into it. Overall, my favorite part of the story was the characters. It felt like a return to the old “western” style adventures of Han and Lando that were just a joy to read (and still are a joy to read). The story was unremarkable but that wasn’t really what makes this type of novel compelling. You go into this type of book expecting an action/adventure story with great characters and that is exactly what you get. Overall, my favorite part of the story was the characters. It felt like a return to the old "western" style adventures of Han and Lando that were just a joy to read (and still are a joy to read). The story was unremarkable but that wasn't really what makes this type of novel compelling. You go into this type of book expecting an action/adventure story with great characters and that is exactly what you get.